For the past 30 years, local talented artists have submitted original artwork with an equestrian theme to the Horse Show’s Poster Contest. 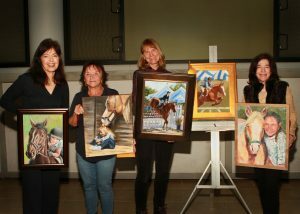 The contest is held to focus on the creative and artistic talents of individuals at local organizations or schools in the Palos Verdes area, to aid in promoting various art programs in the area and to give publicity to the upcoming Horse Show that raises money to benefit Children’s Hospital Los Angeles. This year, the winning entry is the official Horse Show publicity poster The 5 winning entries will be at the Palos Verdes Library in late August and early September and in the Admissions Booth at the Horse Show September 6,7,8 2019. The Poster Contest is sponsored by Mr. and Mrs. Chuck Noski, members of the Peninsula Committee Children’s Hospital since 2006. Aside from the individual prize money, a donation was be made to Children’s Hospital Los Angeles in honor of the first place prize winner and to the Palos Verdes Art Center.